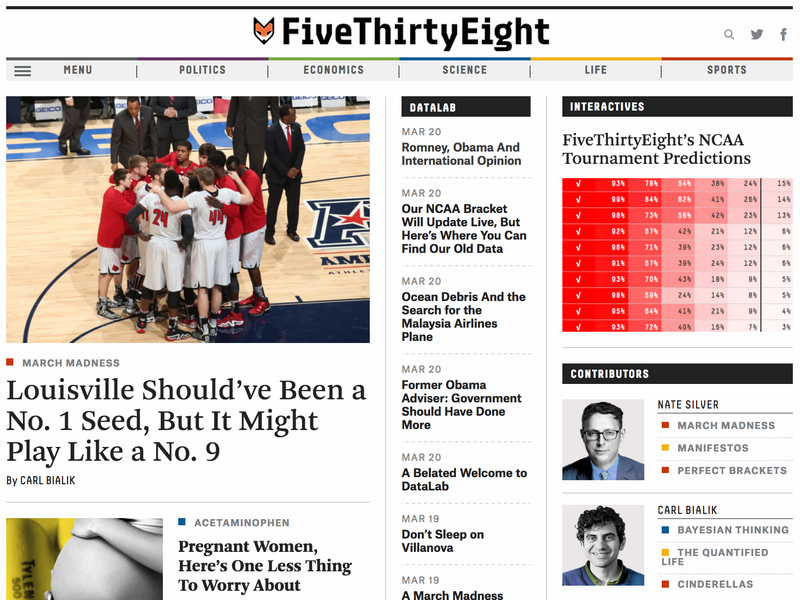 It's taken the naysayers just a few days to react to the launch of Nate Silver's new FiveThirtyEight. The most vocal one has been Leon Wieseltier. It's not surprising. The guy likes to proclaim that this science and data journalism stuff has not place in his cherished turf. For some strange reason he reminds me of a certain editor at El Mundo newspaper who used to walk around the newsroom mumbling that he was looking forward to the day when "this fashionable Internet thing" would go away. This was just ten years ago. Wieseltier is also fond of misrepresenting his targets' points. This is worrying, as he's the literary editor of The New Republic, so you should expect him to be able to extract meaning from a piece of text. But, as philosopher Daniel Dennett wrote a while ago, Wieseltier "doesn't know, and doesn't even know that he doesn't know." Wieseltier doesn't understand (or doesn't wish to understand) Silver, either: "(He) cannot conceive of public reason except as an exercise in statistical analysis and data visualization." This is malarkey. What Silver wrote in his opening manifesto and said repeatedly is that even if numbers are a core component of his new website, he's concerned mainly about evidence. And evidence can (and should) be both quantitative and qualitative. That's explicit in his essay and book. Wieseltier asks rhetorically "I am sorry that (Silver) finds George Will and Paul Krugman repetitious, but should they revise their beliefs so as not to bore him?" Of course not but, again, that's not Silver's point. What he wrote is that journalists should be open to change their thought based on careful analysis. We should stop being driven by anecdote and ad-hoc notions, and become more rigorous. If you think that this is something that all journalists and op-ed writers do, perhaps you've never read Thomas Friedman (have fun with this and this) or Malcolm Gladwell (this,) to name just two popular ones. Wieseltier ends his lazy article with this question: "What is it about conviction that frightens these people?" It's not conviction that frightens us. What frightens us is convictions based on prejudices, biases, and ignorance. How can you fight against them if it's not by wielding qualitative and quantitative methods? Wieseltier doesn't say, perhaps because he may not be able to tell the difference between a median and a mean. A different line of criticism of the new FiveThirtyEight is more interesting. It troubles me, for instance, that Silver hired Roger Pielke to write about science. This is a mistake. I also confess that I'm a bit disappointed with the stories published in the first few days. I am not the only one. We were expecting more depth in many of the stories, perhaps. But, hey, let's cut these folks some slack. It's been just a week!